Alpamayo is one of the most conspicuous peaks in the Cordillera Blanca mountain range of the Peruvian Andes, rising up to 19,511 ft. It is a steep (60 degrees), almost perfect pyramid of ice, one of a number of peaks that compose the Santa Cruz massif, the northernmost massif of the Cordillera Blanca. Although smaller than many of its neighboring peaks, it is distinguished by its unusual formation and overwhelming beauty. It actually has two sharp summits, North and South, separated by a narrow corniced ridge. Alpamayo is famously known as "The Most Beautiful Mountain in the World." 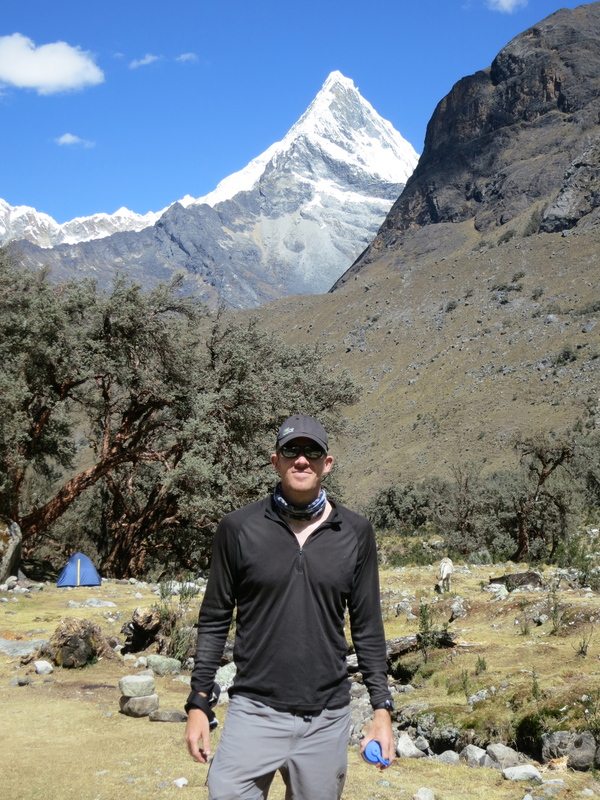 On July 18th, 2012, Nelson Dellis set out on an expedition to climb Alpamayo and its neighboring peak, Quitaraju. While his training before the climb had been intense, the trip was slightly interrupted by a stomach infection that he caught while in town before heading out to the mountains. The combination of his body trying to fight the infection and trying to acclimatize above 17,000 ft proved to be too much for his body to handle. He started to experience strong symptoms of altitude sickness and was forced to turn back down after reaching High Camp on Alpamayo. Such is the nature of mountaineering; always tricky business trying to stay clean and healthy when in remote locations. The body needs to be in perfect condition to properly and safely acclimatize and unfortunately for Nelson, he was not able to do that this time around. No matter, the summit was not the goal! The goal was and always will be to climb for memory and to cherish the memories of the journey it takes to get there. The mountains will always be there but our memories may not! I'm back! 12-lbs lighter, sunburnt, heavily disheveled, and attempting to return to the swing of things (that means sleeping well, relaxing on the beach, and stuffing my face with copious amounts of food...mostly junk food....in an attempt to recover). Here is the summary of my trip: The first few days of my 2-week expedition were an absolute slog. A 6-hour flight to Lima, followed immediately by an ungodly 8-hour bus ride to Huaraz, a small city that rests at the base of many of Peru's massive peaks. Exhausting. The drive from Lima all the way up to Huaraz was a sight to see though. With the Pacific Ocean mostly on our left side, the countryside changed from city, to complete desert and sand dunes, to oasis, to rocky formations, to finally while heading inland, massive snow-capped mountains. Absolutely stunning. Too bad a lot of the scenery was spoiled by "The Glee Movie" which was blaring throughout the bus as we traveled (followed by 4 other pitiful movies). The only saving grace was watching Liam Neeson in "Taken." Good movie. Settling into Huaraz late Thursday evening, I met up and had dinner with my teammates, Charlie and Alisha. Friday we had an expedition debreifing with the folks at Skyline Adventures and then went on a 3-hour hike up to 11,500 ft just on the outskirts of the city with our guide, Nacho (an Ecuadorian Thrash metal band bass player/mountain climber). Hes awesome. Mostly because his metal band is calledThrashformers. The following day we went out of the city to the trailhead of Chalup, a 17,500 ft peak with a sweet glacial lagoon part-way up. Sunday we woke up at 2:30am to drive up to the trailhead of Huarapasca, another 17,500 footer peak. This climb was awesome. Absolutely no one in sight but us, in the middle of nowhere, with not a village in sight. Pretty cool to have the whole peak to ourselves. The climb started with a rock scramble climb and then once we met the glacier, it was all pretty much vertical climbing, laying down one pitch after the other. After about 5 pitches, we reached a small crater which lead up to the final 2 pitches over onto the corniced summit. Reminded me of the classic Chopicalqui summit a bit. Overall, a great climb with a super satisfying summit and view. We headed back to Huaraz for some last minute packing and our last opportunity to stuff our faces with some "civilized" food before the trip. This would prove to be a very bad move. I had a super sketchy Lomo Saltado for dinner (meat and onions with rice and papas fritas). Within hours I was on the toilet, Alien-style. The next morning our expedition began. For me it began with a pretty wretched stomach parasite living in me. We drove 2 hours out to a very small and basic village called Cashapampa, the gateway to the Santa Cruz Valley. Again, stunning. I felt so privileged to be in the presence of some of the mountains surrounding me. I felt like I was in some candy-land, mountain climber's dreamland. Through a deep ravine in the mountainous landscape we slipped through and began our hike up to our first camp. The majority of the trek was steep switchbacks up scree and rock, very reminiscent of the upper parts of the Khumbu Valley on Everest. We reached our first camp mid-afternoon which was at about 3800m above sea level, just as I was struggling to keep my intestines from exploding. Rested a bit, had a phenomenal dinner prepared by our awesome cook, and got some much needed rest (our cook was a professionally trained mountaineering cook BTW. They apparently have schools for that in Peru...he would sprinkle parsley on our meals like he was Emeril). The next day had little elevation gain, but took us through an expansive, out-of-place desert basin before sending us up climbing some more switch backs to Base Camp (4300m). It would be from here onwards that our donkeys would stop helping us carry food and equipment. From here it really started to feel like we were truly in the mountains, in another world. The landscape was so rugged and immense, with deafening, snow-capped peaks jutting out from all corners into the sky. One peak in particular, Artesonraju (the Paramount Pictures mountain) was probably the most beautiful thing I'd ever seen...I would have shed a tear had it not been for the fact that I did not shed a tear. Up until this point my acclimatization was going fine. In fact, I felt freaking strong as hell. I was convinced that my Crossfit training had paid off (still convinced, actually). The only thing was when I ate, my stomach couldn't hold on to it. But as soon as it would "pass" I felt great again. I had no fever or pain, so I knew it had to just be an intestinal thing. No biggie. The next day we climbed up to Morraine Camp from Base Camp. 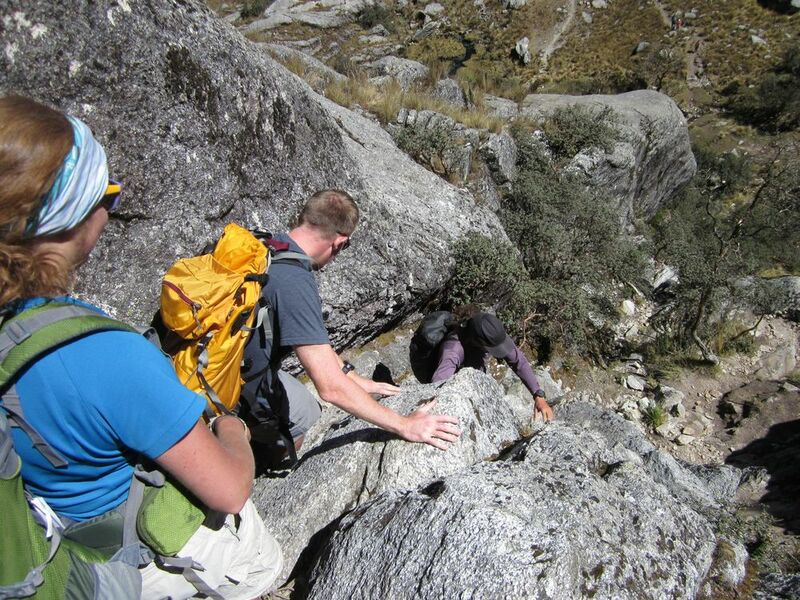 It was mostly a heavily rock-laden slope that fed into the base of the peaks above us (Alpamayo and Quitaraju). I really powered through this climb with my 50lb pack on my back - like a machine. Set up our tents, memorized some cards, ate dinner and slept/rested the rest of the night crammed in our 3-person tent. Up at 8am the next day we packed up and started our glacier traverse. A pretty easy, steady glacier hike with crampons and ropes tied between us, we made it to the base of the shoulder of Alpamayo. To get to High Camp involved ice climbing up over the shoulder of the peak itself and back down the other side. Pretty tough with a pack on, but we made it. High Camp (5500m) was breathetaking. Both Alpamayo and Quitaraju were in sight (with some low-hanging clouds occasionally obscuring the summit). Within an hour of me arriving though, altitude sickness hit my like a dump truck. I have never experienced altitude sickness throughout my whole mountaineering career, but I knew what it was once it hit me: a splitting headache, deafening nausea, no appetite, and my even more-so aggravated stomach situation. I was paralyzed in my tent feeling like crap. I tried eating dinner, but eventually had to let the team know that if I wasn't feeling better by the next day that I'd have to go back down to Base Camp. I knew this wasn't normal for my body. I also knew that it was mostly due to the fact that my stomach was fighting something in my stomach. Which in return, wasn't allowing it to acclimatize as I wanted it to. The next day, I felt even worse. So down it was for me. Just as I was packing I lost all control of my bowels, which was just another sign of how bad it was becoming. My decision had just been validated x10. I shot back down with our other guide Michel, making it back down in a quick 2-hours. Bought a coke from a small hut at Base Camp and chugged it like a mad man. They should seriously make Coke commercials out of mountaineers coming down from altitude and chugging a Coke. You won't find a more authentic sounding refreshing "AHHHH." No joke. Within hours of being down, I immediately felt better. This is the common way of things for climbers. You might ask, why didn't you go back up if you felt better? Well, it's not that simple. My stomach still had to recover, and just because I felt better at lower altitude didn't mean that I was suddenly acclimatized. So, I rested and ate while the team went for the summit that same evening (they summited!). The next day Michel and I raced down to Cashapampa and caught a car ride back to Huaraz where I was able to shower and ate all the food I wanted. The team followed just a day and a half behind. Overall, the trip was amazing. It was such an amazing place to visit and climb in. I'm happy with my decision to forfeit Alpamayo's summit and happy that I always seem to have the good sense to know when my body is not in good shape. I always have to remember that the summit is just a singular point, not the sole purpose of the climb. It's the journey to and from that point that's really what all this climbing is about. And even beyond that, the point is to climb for memory, not to summit for memory. That being said, bring on the summit of Mt. Everest! I've got 8 months to finish my preparation. In the meantime, I'm gonna spend the next few days re-building some important memories, like how good pizza tastes.